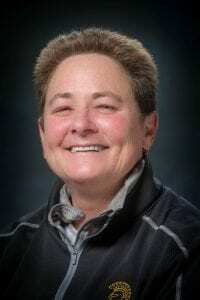 Congratulations to Dr. Emily Wughalter, Professor, Department of Kinesiology, on being named the 42nd Fellow of the National Association for Kinesiology in Higher Education (NAKHE). Emily’s ongoing commitment to NAKHE leadership, scholarship, and the training of young professionals makes her an outstanding choice for this recognition. The Fellows designation is given to professionals in the field of Kinesiology who have made significant contributions to NAKHE for ten years or more. Emily’s leadership in the association has been exceptional, and for this leadership she is being recognized. Leadership in NAKHE is not the only criteria for Fellow status. Emily’s scholarly productivity has added to the body of knowledge in Kinesiology in a meaningful way, one of the most important criteria for Fellowship. “Your leadership and scholarly contributions have extended beyond the field of Kinesiology to your home institution, community, and beyond – contributions that bring distinction to university professors in Kinesiology,” says Steven Estes, Fellow #12, NAKHE. In addition, Emily has been invited to deliver the Rachel Bryant Lecture at the Society of Health and Physical Educators, (SHAPE America) National Convention in Tampa, Florida in April. “This is a tremendous honor to be invited to deliver a lecture in Rachel Bryant’s name and to be recognized by national colleagues in Kinesiology,” says Emily Wughalter. Rachel Bryant was the Executive Director of the National Association for Girls and Women in Sport for 21 years when she led an organization that inspired tremendous change and created sporting opportunities for girls and women. This lecture in her name is to honor an individual who continues her legacy by leading, developing, participating, and organizing programs for sporting girls and women. If you plan on visiting the AT&T Pro Am Golf Tournament, Pebble Beach California, February 6-12, there is a good chance you may be served by one of SJSU’s Special Event Management students. “We have 32 students going down this year. Of those, the majority are Hospitality majors, with a couple of Kinesiology majors and a few majoring in public relations,” says Terry Thompson, Professor, Special Event Management Training. Students setting up an On Course Food and Beverage tent prior to the tournament beginning. The Department of Hospitality Management is excited to celebrate its 12th year of partnership with Pebble Beach Resorts to assist with the 2017 AT&T Pebble Beach Pro-Am. “Our students will be working On Course Food and Beverage, Sky Suites and Chalets,” says Thompson. In order to be chosen for this opportunity, students must complete an application, write an essay and complete a panel interview. “There are over 100 students that apply every year and we only choose 32,” says Thompson. Students gearing up for golf cart training. Once students have been accepted in the program, they must attend over 60 hours of training that is conducted in conjunction with the Pebble Beach staff. In this training, they learn how to set a table properly, adjust shades and lights, and prepare a proper break service according to the Lodge at Pebble Beach standards. From left to right: Advisor Richard Larson, student assistants Anissa Sanders and Victoria Wright, and Advisor Terry Thompson. Sky Suite Team posed for a photo on the 18th Fairway. 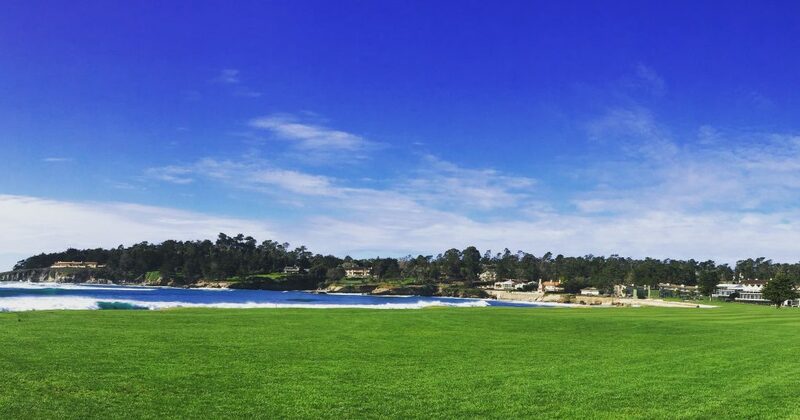 The AT&T Pebble Beach Pro-Am is one of golf’s most celebrated and beloved events. Spanning three beautiful courses on the Monterey Peninsula (Spyglass Hill Golf Course, Monterey Peninsula Country Club Shore Course, and Pebble Beach Golf Links), it attracts the PGA’s top professionals and some of the best-known celebrities. The goal of the AT&T Pebble Beach National Pro-Am is not only to provide a highly competitive and entertaining PGA event, but also raise money for philanthropic causes. It is truly exciting that San José State University has the opportunity to participate in this incredible event. The Hospitality Management Program is always on the lookout for some of San José State’s most responsible, enthusiastic, and professional students to join the Special Event Management Team. SJSU Special Event Management Team. On Thursday, September 29, the 24th Annual Senior Resource & Wellness Fair, presented by the County of Santa Clara Department of Aging and Adult Services (DAAS), in partnership with the City of San Jose Parks & Recreation Department, and SJSU’s Center for Healthy Aging in Multicultural Populations (CHAMP), took place at the Mexican Heritage Plaza in San Jose. Approximately 400 people in the community came out to the Wellness Fair to receive information from 85 different programs that provide information and services to the senior population. There were about 70 vendors from community agencies. 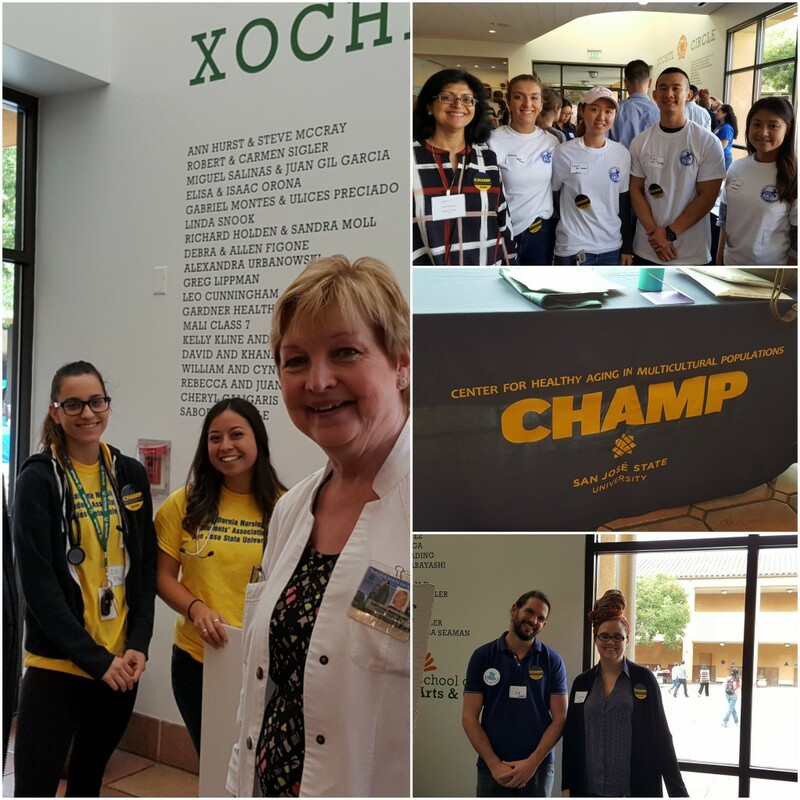 Participants were able to receive a multitude of health screenings – flu shots, blood pressure, glucose, dental, spine alignment, skin, mood, cognitive function, falls prevention, fitness, biofeedback, and hearing tests which were provided by Walgreens, SJSU students and other agencies. Several workshops and fitness demonstrations were also held throughout the day, including Laughter Yoga, Fair Housing Rights, Cal Medi-Connect, and Nutrition. “The Wellness fair offers SJSU students a wonderful opportunity to practice their communications skills, learn how to engage seniors in screenings and health education, and learn about the role of multiple disciplines and the array of community services available to promote wellness and healthy aging,” says Sadhna Diwan, Ph.D.,Professor, School of Social Work, Director, Center for Healthy Aging in Multicultural Populations. The Western Society for Kinesiology and Wellness (WSKW) conference in Reno, Nevada next month will have many representatives from CASA’s Department of Kinesiolgy, Shirley Reeke, past department chair and professor is the keynote speaker along with many faculty participating in the program events that include: Farzaneh Ghiasvand, Jenn Schachner, Stan Butler, Gong Chen, Daniel Bohigian and David Daum. Not to mention that Bethany Shifflett is the coordinator of the conference and president elect. The 2015-16 CEED Award winners were recognized on April 26, 2016, for their excellence in promoting and fostering a deeper understanding of equity and diversity. The College of Applied Sciences and Arts’ Committee to Enhance Equity and Diversity (CEED) reception was held on Tuesday, April 26, honoring six recipients whose combined effort and activities have made an important contribution to enhance equity and diversity at San José State University (SJSU) and/or in the community. CEED Award categories consist of an Undergraduate Student Award, Graduate Student Award, Faculty Award, Staff Award, and Student Organization Award. The purpose of the CEED Awards is to recognize those individuals and groups that have demonstrated excellence in promoting and fostering a deeper understanding of equity and diversity as they relate to issues of age, class, disability, ethnicity, gender, race, religion and/or sexual orientation. Navpreet has led or been involved in several projects that promote equity and diversity on campus. In 2015, she led the Peace Pole Monument project that helped to place an official monument on campus. The Peace Pole is a hand-crafted wooden monument that has the message “May Peace Prevail On Earth” in the 12 most frequently used languages in Santa Clara County. Navpreet also serves on the President’s Commission on Diversity which provides “input, recommendations, and advice to the President on effective ways to create a campus environment that is diverse, equitable, and inclusive.” She initiated this project in an effort to counteract negative publicity related to diversity issues that were occurring on campus. Essraa Nawar is pursuing her passion to be a librarian focusing on programming and outreach in bringing diverse programming to the life of the libraries and the academic institutions she serves. One of Essraa’s strengths is her ability to create an atmosphere of awareness regarding ethnicity, gender, and religious diversity across campus. She serves on the Chancellor’s Diversity Advisory Committee and developed a program on empowering Muslim women. Essraa coordinated the support of the Sikh American Community through Vaisakhi programming, an exhibition on demystifying the turban. She also spoke at a TED Talk in Munich, Germany, to further her diversity message to change the narrative of how people see Muslim women specifically and Muslim people in general. Cotton conceived the slogan “Diversity University” as part of a class project to make a difference at SJSU. He didn’t stop there. Cotton decided to make issues surrounding diversity and acceptance on the SJSU campus the focus of his second master’s degree. Because of him, we now have an annual Diversity Day at SJSU. As a graphic artist, Stevenson created the logo for the event as well. He is now in the final stages of a documentary about the history and importance of diversity on this campus. He’s already completed several impressive interviews for this project which include Jeanne Wakatsuki, the author of Farewell to Manzanar, Erik Grotz, the student who suggested the Tommie Smith-John Carlos sculptures as well as with the artist who created it. Dr. Armaline established and serves as coordinator of the Human Rights Program at SJSU. As a part of that initiative, he implemented the popular Human Rights Minor, a program through which students gain an understanding of various human rights problems that affect their community, including racism, discrimination, and inequality. He is committed to raising awareness on campus to issues of equity and diversity. As a part of this effort, he founded and continues to coordinate the annual human rights event. He chairs the Human Rights Working Group, which serves as a platform for faculty to engage in issues of equity and diversity. Throughout his work, Dr. Armaline single handedly serves as a hub for students who are interested in increasing equity on campus. He informally advises students on activism both on and off campus. Dr. Armaline is also involved in numerous activities in the community. He authored reports on social justice issues, served as a National Board Member in Save the Kids, a grass-roots organization dedicated to alternatives to end of the incarceration of youth, is a Council Member in the Santa Clara County Child Abuse Council. He most recently initiated a partnership with DeBug, a San José media, community organizing, and entrepreneurial collective that leads successful social justice campaigns to advance the rights of youth, workers, immigrants and those impacted by the criminal justice system. In addition to providing extensive administrative support for more than 500 School of Journalism and Mass Communications (JMC) students and 22 faculty, Silvia is a committed advocate for SJSU diversity students. Silvia offers extraordinary time and effort to advising and mentoring all students. She connects on a powerful level with JMC School Spanish speaking students. Her translation skills combined with her knowledge of university procedures and her deep passion for helping students find their voice and express their creativity has resulted in numerous success stories that are greatly admired and appreciated in our program. In Fall 2015, she was a leading advocate for fundraising of the College of Applied Sciences and Arts international learning initiative. She played a significant role in helping persuade a special JMC guest, CNN Correspondent Sara Sidner from Los Angeles, to donate her William Randolph Hearst honorarium to start a newly created fund and campaign to raise scholarship money to help SJSU students from poor and under-represented communities to participate. She plays an instrumental role in helping the school director create Spanish community messages and promotions that invite Bay Area business and schools to partner with JMC. Silvia always finds the time to encourage students and faculty. A team of Iota Chapter members and alumni volunteered at the Center with the Prison Education Project (PEP), teaching the 7 week Academic Orientation Course. They met every Friday with a group of formerly incarcerated individuals currently on parole. They created presentations about college as well as give mini-lectures based on topics in Justice Studies majors (e.g. consequences of mass incarceration and juvenile justice). A big component of this program is engaging the program participants in discussions about the topics presented as well as their interests and needs. In addition, Iota chapter collected and donated 100 backpacks with everyday necessities and held a clothing drive on campus for the Santa Clara County Resource Reentry Center to give to their clients. Congratulations to all 2015-16 CEED Award winners!